CO.NX Moderator (Mark): Welcome to today's webchat. The webchat will begin at 1200GMT. In 1992, Mr. Sullivan joined the Foreign Service of the U.S. Department of State as an Economic Officer, and has served overseas postings in Bahrain, Egypt, and South Africa. He has also served in Washington on the Iraq, Iran, Kuwait, and Bahrain desks. From May 2000 through the summer of 2006, he served as Spokesman for the Department’s Bureau of Near Eastern Affairs in Washington, D.C., working extensively with domestic and international media. In September 2006, he joined the Department of South and Central Asian Affairs as the Director of Press and Public Diplomacy. Mr. Sullivan received undergraduate degrees in Economics and Modern European History from Brown University in Providence, Rhode Island in 1988. He received a Master of Arts degree focusing on Middle East and Islamic Studies from the University of Virginia in 1990, and completed a year of Ph.D. study focusing on the Shi’a communities of the Arabian Gulf. CO.NX Moderator (Mark): We are about to begin. There are many, many questions coming in. Please be patient as Mr. Sullivan works on answers. Also, please keep in mind that many of you are asking similar questions--please check to see if the answer to your question has already been posted! Gregg Sullivan, Spokesman: Welcome, everyone, to this webchat. I'm delighted to see so many people online and I promise I'll do my best to answer as many of your questions as possible. ghulam ali murtaza: Counter-insurgency as proposed by David Petraeus is perceived by many across the border as an effort to control and change their culture that has been pretty much dominant in their society for many years. Why USA has been unable to draw distinction between the natives who are peaceful and those terrorist whose aim is inflict wreckage in world? Gregg Sullivan, Spokesman: Very good question, Mr. Murtaza. I often get this question from Afghans who ask "what happened to your smart bombs - why aren't they so smart?" First I want to say that we go to great lengths to avoid any civilian casualties in our operations, and operations are called off or postponed if there are indications that civilians could be affected. But, the problem is Al Qaeda and the Taliban who are working hard to bury themselves inside the local populations, using civilians as a shield. They do everything possible to make sure civilians will be impacted. At times, they've also used disinformation, suggesting that a civilian gathering, a wedding perhaps, is actually a high-level Taliban or Al Qaeda meeting - basically misleading us into attacking the wrong target. We need to have better information and a surge of personnel in Afghanistan will give us better information on the people and activities and help us avoid incidents that result in civilian casualties. jamaldini: The core issue of all this mess is Durand line which should not be there, why don’t the US pressurize Pakistan to accept this fact? This way NWFP will be part of Afghanistan and there would be no border, which means no militants safe havens. The people in NWFP and Afghanistan speak same language and have the same culture. Gregg Sullivan, Spokesman: While I can't support erasing the Durand line, I recognize what you're really calling for: an establishment of law, order, and a viable economic system in the Pakistani tribal areas. On those points, I'd say we're in pretty close agreement. Our strategy is an attempt to help the Pakistani Government introduce government, basic services, the rule of law, and a viable economic system into an area that has been under tribal rule for centuries. Through the IMF, World Bank, and other international institutions - together with our additional $1.5 billion in foreign assistance - we hope to bring opportunity, infrastructure, jobs, and services to this region. And, in so doing, illustrate to the people of the tribal areas that the "social contract" between government and the people involves responsibilities and benefits on both sides - but a relationship that, in turn, makes both stronger and more prosperous. Sarah Alam, Karachi (Spokesperson Pak-US Alumni Association Karachi, Lecturer Jinnah University for Women): First of all I would like to commend the honorable President for his newly proposed strategy. However I would like to put forward my concern over the growing acts of terrorism in Pakistan. By any means, the threat of terrorism exists and is growing day by day, and the conditions of Pakistan are becoming deplorable. How in the present scenario can we measure the effectiveness of this newly proposed strategy? Gregg Sullivan, Spokesman: Thank you, Ms. Alam for your question. Obviously, we, too, are concerned about the scale of terror attacks. The Al Qaeda and Taliban leadership has killed thousands of Pakistanis over the past year, and their growing threat is what drove this new strategy. On measuring the effectiveness, I will admit we still have some work to do to put them in place. President Obama has emphasized that the strategy must be flexible and easily changed to new conditions. We know we're going to review the strategy regularly. I can assure you this isn't the last time you've heard from us about the strategy and how it's going. I see many regular updates from the President and others on where we think the situation is going. farid.areu.af: How corruption can be moved from the Afghan government? And how narcotic can be eradicated from Afghanistan? Gregg Sullivan, Spokesman: You ask two excellent questions Farid, and I won’t lie by saying the solution is easy or quickly-implemented. As President Obama said, “we cannot turn a blind eye to the corruption that causes Afghans to lose faith in their own leaders.” We see in consistent polling of Afghans that corruption remains one of their top concerns – and in many cases their number one concern. It prevents the delivery of relief and development projects to ordinary Afghans and presents the Taliban with a significant recruitment opportunity. The durability of the Afghan state rests on the trust of its people and their ability to expect delivery of basic services. But, how do you fix it? Well, I won’t claim that we have all the answers, but we have some ideas. First, we recognize that the previous Administration’s focus on Iraq prevented us from having the focus, resources, and personnel to adequately take on the corruption challenge. There are 396 districts in Afghanistan and not nearly enough of an international civilian presence to establish regular discussions, training, or monitoring of the developmental situations in all of them. Our developmental efforts have been hampered by a lack of consultation with local leaders and a lack of personnel to adequately oversee them. This helped create an environment where corruption could continue without ever being discovered – or its extent throughout the government effectively countered. So, the first step is the “civilian surge” the President spoke of – to get enough talented people to work with local leaders, train them, monitor progress on developmental programs and effectively coordinate with their international counterparts. Another idea is to expand the scope and size of our rule of law programs through education, enhanced enforcement, and the establishment of ongoing monitoring mechanisms within the Afghan Government – the “checks and balances” we often talk about in the West. The President also stated that we will pursue a new understanding with the Afghan Government that cracks down on corrupt behavior and sets clear benchmarks for international assistance so that it provides for the needs of the Afghan people. On our end, we too, will enhance the role of the Special Inspector General for Afghan Reconstruction to ensure that money for U.S. contracts is spent in the way it was intended. We can’t expect universal change overnight, but we believe these steps will help create an environment where transparency and accountability can supplant corruption. Obviously, as we tackle corruption, we’re also going to have to tackle the illicit opium trade. We’re starting from the conclusion that previous counter-narcotics efforts have been ineffective largely because illicit drugs have become too central to the Afghan economy. Reliance on eradication doesn’t work because it unfairly puts all the burden on the poor farmer trying to feed his family. The objective shouldn’t be to punish desperate people. Virtually all Afghans would agree that they’d rather grow legal crops, but with no roads to take product to market how could they sell them? The solution to the narcotics trade needs to be rooted in sound economics and agricultural policy. We need to look at alternative crops and examine the entire set of infrastructural requirements--from cultivation, irrigation, preservation and transportation, to finding buyers for the product at market. This means working with farmers concerning their soil and what will grow, training people in the secondary markets of agricultural packaging and preservation to ensure the product can remain fresh on long trips by road, building roads to markets, and establishing mechanisms for sellers to find buyers both domestically and internationally. Hi-nutritional value wheat is one product we think would work as an alternative to poppy, and as we go forward we will be filling in the details of what else in the chain needs to be there, so farmers can stop growing poppy. Gregg Sullivan, Spokesman: Thanks, sure - the big highlights are the creation of a Trilateral Dialogue between the US, Pakistan, and Afghanistan that will focus not only on security matters but trade, energy, and development. There are significant new troop commitments for Afghanistan, a civilian surge that will enable us to reach far more of the 396 Afghan districts than we ever have, and a strong anti-corruption push through a Special Inspector General here and a new Afghan Anti-Corruption office. Also important is the US commitment to a reconciliation process with those who are not "hard-core" Taliban, and can be brought into the political process. Riaz Haq: Why was Kashmir dropped from Ambassador Holbrooke's charter as US special envoy to the region? Do you think this decision will help or hurt the US efforts in the region? Gregg Sullivan, Spokesman: Ambassador Holbrooke's mandate is Afghanistan and Pakistan, and to be fair, we think that's probably a full-time job. Certainly, we are interested in the long-term improvement in Pakistani-Indian relations and continue to assist in any way we can. While Ambassador Holbrooke will not address Kashmir as part of his mandate, he will promote dialogue between India and Pakistan, recognizing the importance of solid regional cooperation as a foundation for his efforts. I want to add to my answer for the Lincoln Center in Karachi this second part: On the Pakistan side, the highlights are an additional $1.5 billion in US assistance in infrastructure, education, and job-creation, and a clear set of benchmarks that will be developed and linked to this assistance. Obviously, the trilateral dialogue I mentioned earlier will assist Pakistan with its efforts as well. And working with the IMF, World Bank and others, we hope to get more resources for Pakistan to address its economic needs and extend its effective governmental control over the tribal areas. And when I say control, I don't mean just troops; we mean the provision of water, food, electricity, housing, schools, and all the things that a citizen should expect from its government. Daud, Lincoln Center, Herat: can Afghanistan and Pakistan be good friends in the future? Riaz Haq: Do you think Pakistan has a strategic interest in Afghanistan now and in the future when the US eventually leaves the region? If so, how do you see it? Do you think Pakistan’s interest in Afghanistan aligns with the US interests now and five or ten years from now? I think it would be fair to say that many in South Asia and around the world began to doubt the US strategic interest in Afghanistan following the war in Iraq. As the pace of development in Afghanistan stagnated and the US preoccupation with Iraq grew, it's likely that Pakistanis began to doubt the durability of the US commitment and the likelihood of a functional state emerging in Afghanistan. Under such circumstances, I could see many Pakistanis concluding that Pakistan had no "strategic interest" in Afghanistan--only a "strategic threat" that would have to be managed without the United States’ involvement. But, as President Obama's speech conveyed, the US does, indeed, have a strategic interest in Afghanistan, and Pakistan should see one as well. Despite the problems in the international effort, Afghanistan has made great strides in healthcare, education, and economic growth. And, with a revitalized US commitment to Afghanistan, Pakistani leaders should feel empowered to see Afghanistan as a political, economic, and strategic asset for Pakistan. The President spoke about the importance of addressing common issues of concern like trade, energy, and economic development through a standing trilateral dialogue. It is our hope that this forum may be the most visible means to illustrate that Afghanistan's success, its economic growth, and political maturation can yield important benefits to Pakistan in security, trade, export markets, and job creation. So, in answer to your original question, "yes," Pakistan should see a strategic interest in Afghanistan and not see it as a long-term threat. And, through this Trilateral Commission we hope to underscore that opportunity. Zubair. Lincoln Center Herat: Do you think if US helps Pakistan to be secure that will help to secure the region? Gregg Sullivan, Spokesman: Zubair, I think you're very right about the need for Pakistan to feel secure, and while the President was clear about the mixed results we've had in fighting terrorism is Pakistan, I think the real key to this new strategy is the fact we're trying to generate economic growth and new assistance that will make Pakistanis feel secure. We hope the $1.5 billion can be used to build infrastructure that attracts foreign investment and creates new jobs. We're also looking to provide training that creates a better workforce in Pakistan, and allows them to get higher salaries for their work. All of this should make Pakistan feel more economically secure. On the political side, we think the Trilateral Dialogue will help reduce tensions with Afghanistan, and our ongoing efforts to promote India-Pakistan discussions should also help. I'd like to address the charge that has come up in several questions regarding the view that the US is waging war against Muslims or Islam. I know you've heard comments like those I'm about to make, but they need to be said until the point when they're no longer necessary. The U.S. Government has no quarrel with Islam, one of the world's great religions. I know from my own experience in the Muslim world that Islam is a faith of peace and submission. There are extremists in any faith - Christianity included - that will take doctrine to the point where it misses the larger message of peace, love, and compassion. Those individuals - the ones using Islam as a pretext for attacks against others - are the ones we have problems with. A professor of mine in graduate school talked openly about his desire to get back to a period under the Umayyad Caliphate when a flourishing dialogue existed between Christians, Jews, and Muslims that focused on the common problem of man's alienation from God. While some may take issue with his historical depiction, his point was that we can achieve far more by working together based on what joins us, than by fighting over what divides us. The world gets smaller everyday while the population grows by several millions. The challenge of raising children in this age with enough to eat, a job waiting for them, and a solid moral grounding is filled with ethical and technological challenges even our own parents never dreamed of. Making enemies of several hundred million adherents to Islam isn't going to make that challenge any easier for Americans. Riaz Haq: The demand on Pakistan to ''cut ties between parts of its government and the Taliban'' seems to be at odds with the desire to ''peel away up to three quarters of the Taliban’s rank and file in Afghanistan from the Taliban’s leadership''. Do you think that the ISI's links with the Taliban can serve a useful purpose in attempts to reconcile with a substantial percentage of the Taliban? Gregg Sullivan, Spokesman: Much has been written in the West about the ISI and its reported links to Al Qaeda and the Taliban. And, while we think it's fair to say that the institution is in need of reform and oversight, we think it would be unfair to characterize all members of the ISI as agents of terrorism. We have cooperated with the Government of Pakistan on important intelligence matters before, and see that as an important foundation for broader cooperation. Important to any intelligence structure, however, is submission to the nation's political leadership - who, in turn, are accountable to the people of Pakistan. Sivasubramanian Muthusamy: The discussions so far indicate that the US Government wants to increase international civilian (non-governmental organizations?) presence in Afghanistan, spend $1.5 billion in foreign aid, and to undertake programs such as encourage alternate crops. My question: Are these measures sufficient? The developing countries' experience with foreign aid has been that the impact of the funding and programs has always been negligible. How would the new administration CHANGE the way the funding and the overall program administration work? Gregg Sullivan, Spokesman: Mr. Muthusamy, great question, and it's something we're spending a lot of time on right now. First, I would agree with you. It's very tough to administer assistance through NGOs unless you have enough USG or international officials in place to watch that every dollar is going where it should. That's why the civilian surge is so important. We realize that part of the reason corruption and a lack of coordination has been such a problem in Afghanistan is because we simply didn't have enough civilians on the ground. We had a lot of personnel in Iraq and not enough in South Asia. It meant we did top-down management, and we weren't getting all the facts from "real people" on the ground. We're not going to make that mistake again. We're going to put hundreds of new officers on the ground all over Afghanistan - in as many of the 396 districts as we can, so we can see the projects, monitor the progress, respond to needs from local officials, and switch our tactics if needed. Gregg Sullivan, Spokesman: The US exit strategy is fairly simple: we can begin to leave as Afghans and Pakistanis deal with their own security problems, including in the border regions; effective governance has reached an acceptable level; and corruption is under control. President Obama has emphasized that flexibility should be a key element of this strategy. And so, while it is certain that there will be clear benchmarks established, we're going to exercise discretion and flexibility in determining a timetable. I think it's important to note that this is not the last discussion you've heard regarding the new strategy. There will be a series of regular discussions that evaluate where we are, where we're headed, and what needs to be done to stay on course. And those discussions will always begin with consultation with the people of the region. Haroun Mir: President Obama has indicated in this new strategy the need for a civilian surge in Afghanistan. However, one of the problems in Afghanistan is lack of coordination among different donor countries. For instance, in major Afghan ministries we have advisors from different countries, who sometimes disagree among themselves on key policies. In addition, subcontracting development works to private companies in a country like Afghanistan, which are profit-seeking institutions, is one of the reasons behind slow progress and mismanagement of funds. Don't you think that a new strategy in Afghanistan would require a change in the way the US has worked in Afghanistan in the past seven years? Gregg Sullivan, Spokesman: Haroun, I agree with you 100% that a new strategy also requires a change in the way the US has worked in Afghanistan, and I think the new strategy gives us some important new tools to counter the corruption and lack of coordination that has disheartened so many Afghans. As I mentioned, we’re taking a harder line on corruption both by enhancing our own Special Inspector General position, but also by encouraging the Afghan Government to create its own position to root out corruption. I mentioned earlier about how more civilian personnel will help reduce the opportunities for corruption, but they can also enhance coordination. Up until now, we’ve been hampered by the simple fact that we don’t have enough implementers on the ground. Our coordination has been top-down, when it should be from the bottom-up. A surge in the civilian presence could go a long way in creating that bottom-up dynamic in the 396 Afghan districts we’re trying to reach. Haroun Mir: We Afghans have been telling for the past two decades that Afghanistan is a victim of Pakistan and Saudi's wrong policies in the region but the State Department has always ignored our plea. Today, there is a growing consensus in the US about Pakistan's support for the Taliban in Afghanistan. In fact there are two major countries in the Islamic world which directly support terrorism--Iran and Pakistan. The IRGC supports Hezbollah and Hamas, and the ISI supports the Taliban and Kashimiri Jihadist groups. However, Iran is punished and insolated while Pakistan is rewarded with billions of dollars of military and humanitarian assistance. How would you explain the US' double standard policy in the region? Gregg Sullivan, Spokesman: I have to disagree that there is a double-standard since the situations with Iran and Pakistan are so vastly different. The Iranian Government articulates a policy of destabilization that it implements through a coherent governmental apparatus. While no one would disagree about the presence of violent extremists inside Pakistan, it is more a question of Pakistan's capability to challenge them effectively and the ability of its political leadership to bring under control those elements sympathetic to the extremists. We have cooperated with Pakistan before on important security issues. Pakistan has shared information and intelligence that has saved US and British lives. In Pakistan, our challenge is to get beyond the "mixed results" we have seen. With Iran, I'd argue that we're much further away from calling the glass "half-full." Myda: How optimistic are the US strategists regarding the new Pak-Afghan Strategy? What support are they expecting from Pakistani citizens to successfully implement this strategy? Gregg Sullivan, Spokesman: Myda, thanks for your question, and I guess I'd say we're cautiously optimistic. We think the strategy reflects new US leadership - a leadership I think a lot of nations felt was missing during the Iraq effort. In many ways, a lot of us who have worked South Asia the past few years feel as if we were not spending the time, resources, and money needed to address the problems. Personally, I feel very optimistic because it's clear South Asia is so central to the President's foreign policy objectives. And I think we're trying to go slowly and methodically in addressing tough problems. On the second part, the Pakistani people can play a huge role. First, I want to say we recognize that the US commitment to democratic ideals has been questioned in Pakistan, and we're committed to actions that leave no doubt about that support. While we're firm on the need to confront Al Qaeda and Taliban, we hope our commitment to development, job-creation, and the rights of Pakistanis will help bring around the support of the Pakistani people. gill: Drone Attacks must be stopped, ruining our economy, destabilizing the country, spreading hate between people of Pakistan (Punjabi , people of tribal areas)! USA must have a peace deal. Sitting 7 years in Afghanistan, they have not won the war. Now destabilizing Pakistan. mani41: I say this: just stop the f***ing Drone attacks ASAP. If you want to take out targets, you need better recon; just bombing at will isn't going to solve the issue. What it will achieve is continued hate sentiment from the Pakistani population in general and more fanaticism from the militants and their tribes/race. Gregg Sullivan, Spokesman: As I've said, the US wants to work with Pakistan in confronting the violent extremists there. But years of mixed results have allowed Al Qaeda to grow stronger within Pakistan. As we work towards a better strategy with the Government of Pakistan, it is our hope that such strikes will be unnecessary. For now, though, the threat is very real and we are aggressively going after high value targets engaged in planning future attacks. Riaz Haq: Will the US covert war (via US drone attacks in Pakistan) continue after the unveiling of new strategy? Or will it be expanded and intensified? Gregg Sullivan, Spokesman: Let me start by saying clearly, the United States does not want to operate militarily in Pakistan. But, the threat that Al Qaeda and the Taliban present to us, to Pakistan, and to the world means SOMEONE must. It is by far our preference that Pakistanis eradicate the terrorist presence inside Pakistan. The Al Qaeda leadership that perpetrated the 9/11 attacks currently reside in Pakistan. Since 9/11, they have vowed to strike again and have done so repeatedly: in London, Bali, Spain, Morocco, India, Kabul, and in Pakistan. They've killed far more Muslims than non-Muslims in their attacks. They've killed thousands of Pakistanis, including Benazir Bhutto. This is not an American problem; it is a threat to all nations of the world, and should be for Pakistan, too. As President Obama said, we have great respect for the Pakistani people and their rich history. And, we recognize that Pakistanis want much the same as we do: freedom from violence and poverty, the rule of law and an opportunity to make a better life for themselves and their children. But, having the world's most dangerous terrorist network in Pakistan's backyard will not get Pakistanis what they desire. Al Qaeda will lure Pakistanis with false promises of security, threaten those Pakistanis that don't share their Salafist views about what's permissible in an Islamic society, and provoke other nations with vicious attacks, then hide using the Pakistani people as a shield. They'll try to tell you that the West attacks Pakistan because we're waging war with Islam, when it's Al Qaeda that repeatedly attacks and hides behind a perverted banner of Islam. The Pakistani people and American people deserve the same thing: freedom from fear. And that is only possible once Al Qaeda ceases to call Pakistan home. We know that Pakistan's ability to counter Al Qaeda is linked to its own strength and security, including its economic security. We'll continue to work with the IMF, World Bank and other international partners to help Pakistan create jobs and provide basic services for its people. We're contributing $1.5 billion of US funds in direct support to the Pakistani people to build roads, schools, and hospitals. We're even creating Economic Opportunity Zones in the border region to help develop the economy and create jobs. And, we're pledging now to stand behind Pakistan's democratic institutions in a way that leaves no doubt about our principles. We'd like to offer "hope" to the Pakistani people. As you consider all this, I would ask you as well to consider what exactly the Al Qaeda extremists offer Pakistan: repression of women; extreme Salafist views that leave no room for dissent; poor educational standards; a lack of foreign investment; and fear. There can be -- and is -- a better future for Pakistan. Zohra Munir: Diplomats can play good role but media is more powerful to build trust between people of Pakistan and Afghanistan. My question is this how you will build or gain trust in these countries, because an average person thinks America is enemy for all the world, so please first you have to think about this. Gregg Sullivan, Spokesman: Zohra - Another good question and yes, I agree--we have some work ahead of us to convince the Pakistani people. As I mentioned in the answer to Myda, we recognize that we need to have our deeds match our words--to defend democratic institutions in Pakistan that reflect the will of the people. Second, we also have to communicate better with the Pakistani people, and we're looking at ways right now that would expand significantly the exchanges we do--cultural exchanges, educational exchanges, and sports exchanges. We want to do more training: language training, job training, skills that can enhance the ability for Pakistanis to find work and compete in the global economy. Americans, as a people, are happiest when they feel they're doing something good in another nation. It's time we did more of that in Pakistan. CO.NX Moderator (Mark): There are many of questions waiting for Mr. Sullivan, please be patient as he tries to answer as many as possible. If you would like to submit a comment, please do so and we will post selected comments to the webchat. gill: To make a good policy Americans must consult with Pakistan Army and People of Pakistan! SaadZ: Gregg, one more thing. US $1.5billion/year are peanuts. You do know that right? Gregg Sullivan, Spokesman: Saad, I'm not sure I would agree. First, I would say that with the global economic downturn, $1.5 billion is actually a lot right now to the American people. We, too, are seeing home foreclosures and a record number of people out of jobs. So, contributing $1.5 billion right now in these economic circumstances is actually a big sign of how important Pakistan is to us. Second, a billion and a half dollars can accomplish a lot of development in South Asia. For example, we've found that we can provide language training for a South Asian for two years for as little as $2000. We can do a large number of power generation programs or irrigation projects, for that amount. In some sense, the economic downturn helps because with global prices down, $1.5 billion actually goes a lot further than it would have a year ago. Farrukh: Mr. Sullivan, hiring or seeking assistance from young minds in Pakistan in seeking advice on issues, won’t it be better to seek their insight on issues so that it can be reflection of Pakistani perspectives from members of its own society? People selected should be young blood, literate and having the leadership capacity (like me) to make that difference in eradicating extremism once and for all. Awais: Mr Obama in his campaign said he wants good relations with the people of Pakistan. Rizwan: I do believe that all situation is in Pakistan because Pakistan stepped forward to play its role in the modern world and became part of USA and western countries in combating with War against Terrorism. Pakistan encountered unrecoverable losses to help its friends, NOW is the moral responsibility for all nations to help Pakistan in difficult time instead painting a wrong picture of Pakistan and its people around the world. gill: Why American government is blaming ISI on links with Taliban? They must respect Pakistan GOVERMENT AND ITS AGENCIES? Gregg Sullivan, Spokesman: Thanks Gill because I did want to address the ISI briefly today. First, I'd say a lot has been written about the ISI and its reported links to Al Qaeda. The ISI is often singled out by think-tanks and newspapers around the world as the culprit behind the violence. For us, I think it's fair to say that the ISI needs reform and better oversight by the political leaders who report to the Pakistani people. But, it is unfair to characterize all individuals in the ISI as agents of terror. We have worked with Pakistan before very successfully. Intelligence from the ISI has saved American and British lives and foiled terrorist plots on international airliners. The President was careful to say we've had mixed results - and that means, we've had times of great cooperation and other times not so much. We want to see more consistency and making Pakistan feel more secure should help that process. You can write us at conx@state.gov for more information. All are welcome. Kashif Malik: It’s good if USA considers Pakistan as valuable ally in WAR AGIANST TERROR but practically, Americans didn't do much to help Pakistan in return of Pakistan's support for USA cause. khalid: The new AF-PAK policy is appreciable as it tries to catch up from where it was left by the U.S in the 1980's, however the expectations in the region are great and failure is not an option. myda: Pakistan has a been a victim to violence since a couple of years now but why are these actions coming at such a later stage when the violence has become a full blown issue threatening not just Pakistan but generally the entire world? Local terrorists are provided training here and have largely penetrated themselves into the local terrorist bodies of Pakistan that actually are suspected for having supported the terrorists. Khalid: Mark I think U.S package will better serve the region if helps institution building, police being a priority because of its role in maintaining peace. Sivasubramanian Muthusamy: Aren't these proposals coming top down from the State Department, rather than emerge by involving the participants of the people from the region? The course of action appears to come top-down, the scale of the funding comes top-down, even the details of allocation are decided top-down. As the US moves into the participative era, it would be better to be open about what needs to be done, take the local views and wisdom into account and perhaps arrive at what is needed and what could be effective by participation? That was NOT a comment on the expertise of the State Department, just that local conditions are peculiar, local needs are peculiar, and more often than not, policies and programs shaped remotely do not fit into local conditions. myda: I agree with you Mr. Saad: for a strategy to be effective it should have a bottom-up approach rather than a top-down approach. CO.NX Moderator (Mark): We are approaching the end of the hour. We hope you will understand that there are many, many questions coming in. Mr. Sullivan is trying to answer as many as he can in this limited time period. Transcripts are available at http://co-nx.state.gov within 24 hours or by writing directly to us at conx@state.gov. Naimat Ullah Khan, LC Karachi: Mr. Sullivan, don’t you think a grassroots level, people-to-people interaction is needed to effectively deal with our problems? Gregg Sullivan, Spokesman: Mr. Khan - I agree with you 100%. The grassroots element has definitely been missing in our efforts. As I mentioned earlier, we didn't have the personnel on the ground to have reliable information in Afghanistan, and so development projects lagged, corruption grew, and coordination withered away. The civilian surge should help us establish those grassroots connections. I'm also directly involved in an effort to expand the exchange platforms we deploy -including jirgas that solicit the views of tribal and religious leaders on what they think we should be doing in development and security. On the Pakistani side, I think we can expand greatly our efforts to reach Pakistanis--more exchanges, more training, more opportunities for Pakistanis to learn what Americans are really like--and vice-versa. SaadZ: Thank you Gregg, we should do this again sometime. 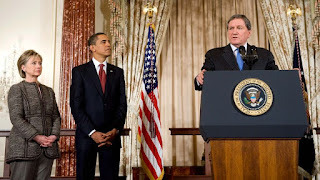 Richard C. Holbrooke, the Obama administration’s special representative for Afghanistan and Pakistan since 2009 and a diplomatic troubleshooter in Asia, Europe and the Middle East who worked for every Democratic president since the late 1960s, died on Monday evening at George Washington University Hospital in Washington, D.C.
Mr. Holbrooke’s signal accomplishment in a distinguished career was his role as the chief architect of the 1995 Dayton peace accords, which ended the war in Bosnia. It was a diplomatic coup preceded and followed by his peacekeeping missions to the tinderbox of ethnic, religious and regional conflicts that was formerly Yugoslavia. More recently, Mr. Holbrooke wrestled with the stunning complexity of Afghanistan and Pakistan: how to bring stability to the region while fighting a resurgent Taliban and trying to cope with corrupt governments, rigged elections, fragile economies, a rampant narcotics trade, nuclear weapons in Pakistan and the presence of Al Qaeda, and presumably Osama bin Laden, in the wild tribal borderlands. His tenure in the Obama administration had mixed reviews. President Obama sent in more troops, as Mr. Holbrooke had wanted, but there was little military or civic progress. Mr. Holbrooke’s relationship with President Hamid Karzai of Afghanistan was icy. He clashed with Gen. Stanley A. McChrystal, the commander fired last June. Some experts said that merely avoiding disaster would have been a triumph. But many said the tenacious Mr. Holbrooke was the right man for the job. A brilliant, sometimes abrasive infighter with a formidable arsenal of facts, bluffs, whispers, implied threats and, when necessary, pyrotechnic fits of anger, Mr. Holbrooke dazzled and often intimidated opponents and colleagues around a negotiating table. Some called him a bully, and he looked the part: the big chin thrust out, the broad shoulders, the tight smile that might mean anything. But admirers, including generations of State Department protégés and the presidents he served, called his peacemaking efforts extraordinary.